Bing Crosby pilas golficas inspiciens, anno 1942. 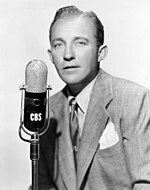 Henricus Lillis "Bing" Crosby, Iunior (natus Tacomae in Vasingtonia die 3 Maii 1903; obiit Matritu die 14 Octobris 1977) fuit illustris cantor et actor Americanus. Vicimedia Communia plura habent quae ad Bing Crosby spectant. Novissima mutatio die 13 Augusti 2017 hora 18:46 facta.